Time will tell if DoublePlus--presented at Gibney Dance Center's new Agnes Varis Performing Arts Center near City Hall--proves to be more than the sum of its parts. But last night's performance, the first for this new dance series, represented a bold move by programmer Craig Peterson and his first artist-curator, Annie-B Parson. Not springing from any centralized aesthetic, each segment of the six-week DoublePlus season has been curated by a different dance artist invited by Peterson. In addition to Parson, the curatorial lineup for Fall 2014 includes RoseAnne Spradlin, Miguel Gutierrez, Donna Uchizono, Jon Kinzel and Bebe Miller. Each have invited two emerging or mid-career choreographers to share a four-evening program. Parson's program introduces works by the multidisciplinary Royal Osiris Karaoke Ensemble (the partnership of Tei Blow and Sean McElroy) and dancer-choreographer Audrey Hailes and continues through this Saturday with all shows at 7:30pm. 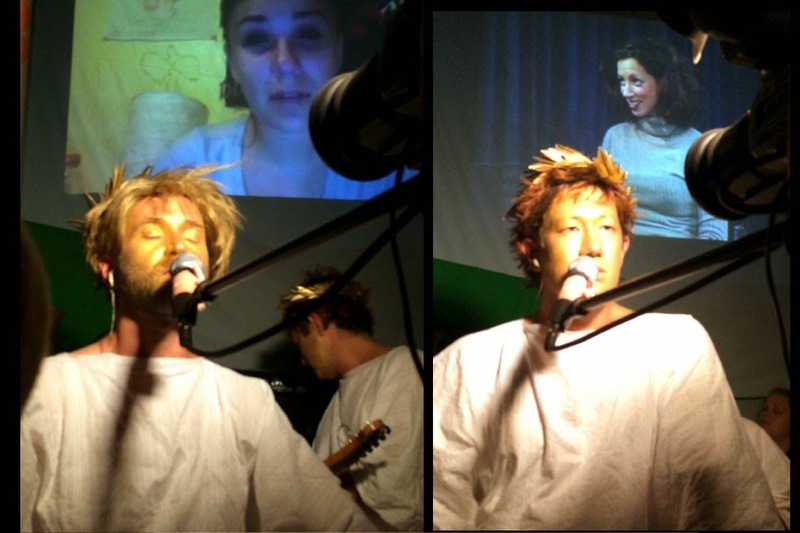 Blow and McElroy of Royal Osiris Karaoke Ensemble, working in multimedia performance installation, describe themselves as "a musical priesthood that explores the metaphysics and mythologies of love, desire and courtship at the end of the 20th century." Nice...and bland...but that doesn't quite prepare you for The Art of Luv (Part 1), for being wafted on a nonstop magic carpet ride through a live and video landscape of New Age meditations, channelings, video blogs for makeup and jeans, and hyped-up self-improvement infomercials, all seamlessly connected to one particularly sinister video centerpiece. ROKE's stated aim--take it as sincere or, given the hokey costumes, decor and projections, ironic or possibly both--is to heal the world, particularly where masculine insecurity is concerned. Maybe everything seen and heard here shares a certain underlying pathology. And maybe, through the wizardry of highlighting those toxic interconnections, these dedicated karaoke masters are among the best healers going. Hailes calling herself "a so-called theatre artist" seems fitting, given my overwhelming sense of her, in Death Made Love to My Feet, as someone often thrown into space and landing at odd angles, weirdly and precariously attached to things like stools or columns or just air, as if these things had just arrested her fall. I also locate her as she appears to locate herself--as an artist amid decades of sticky social and entertainment history. A Black woman in the arts who finds herself walking past or through energy fields that contain things like Ailey's Revelations, and Beyoncé, and Miss Mary Mack-style clapping games (with co-performers Jasmine Coles and Alison Kibbe), and Barbara Walters training her laser eyes on a ravaged Richard Pryor. There are women warriors in there, too. Do I see Hailes because of these layers or despite them? Or both? And it is just wild when the door to the theater's greenroom opens in a burst of light, and we get our first glimpse of Coles and Kibbe--or, really, just parts of them--while Hailes soldiers on right in front of us. Where to look? The light from that room is undeniable--also, the mystery of who the hell these other people are. What the hell are they doing? Confusion ensues. And I kind of loved it all. For more information and tickets for this program and all upcoming DoublePlus shows, click here.